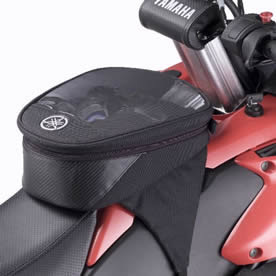 This universal snowmobile tank bag is made from heavy duty nylon with a clear plastic window for trail maps. Attaches securely with a strap to loop around the gas cap and side straps that tether to the footholds. Reflective Tuning Fork logo. Designed initially for the Phazer, Venture Lite and FX Nytro, but fits most snowmobiles.